The Professional Series 32 Camera 4K NVR with PoE is an economical choice for home or professional consumers looking for an H.265 and H.264 NVR that will support a range of resolutions for IP cameras, including the popular 4MP cameras and 4K security cameras. It comes with 16 built-in PoE+ ports to get you started, and you can add more cameras using an additional PoE+ switch. The built-in PoE ports offer plug and play operation without any need for ip address configuration on the cameras, which is great for non-technical users. 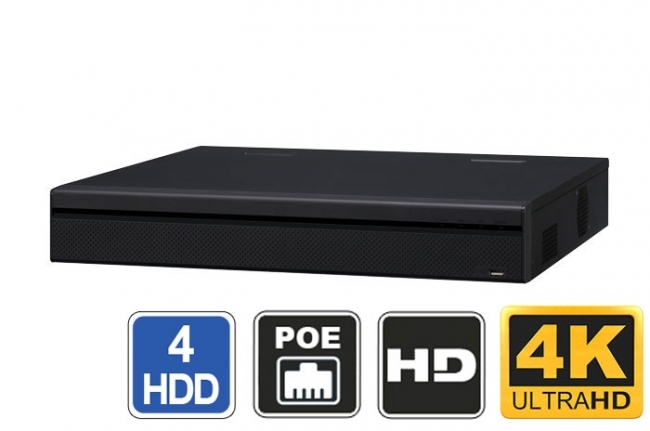 This NVR is a mid level recorder as it offers 4 SATA ports for up to 24TB of video retention, and a total of 200Mbps encoding bit rate. This is plenty of bandwidth as it will allow multiple 4K cameras to be recorded in realtime 30fps. If you are looking for more storage space, please consider the Professional 32 Channel 4K NVR with 16 PoE and 8 SATA ports. If you require more encoding power and hard drive storage space, then we suggest the Enterprise Series 32 Channel NVR with 8 SATA ports that offers a 320Mbps of video encoding bandwidth and RAID Hard Drive Mirroring. As with all of our NVR recorders, you can set recording resolution, frame rate (fps), and encoding bit rate individually for each camera so you can have a mix of cameras supporting different resolutions. As all of our 4K video recorders, this unit has 1 HDMI output that supports 4K monitors or TVs so that cameras can be viewed in detail. There is an additional VGA output for displaying identical output to a secondary monitor at resolutions up to 1080P. This unit is a sleek 1.5U rackmountable case with USB ports in the front and back for attaching a mouse or external storage like a flash drive for backup or our external DVR hard drive expander that will let you add up to eight more hard drives for video recording. It has all the bells and whistles that even a PC based NVR cannot provide. Video back-up is easy using the USB 3.0 ports to export video to a flash drive. You can even conduct live video recording to a FTP server such as a NAS, or pair to another NVR for backup video retention. This way, if your main NVR is ever damaged or destroyed, your video footage will still be protected by being saved in another location on another device. You can connect this and our other DVR recorders to motion sensors using the alarm input connections on the back, and even attach devices like PA speakers, sirens and strobe lights to its alarm inputs. This IP camera video recorder comes equipped with 16 alarm input connections and 4 relay outputs. You most likely will not need all of them, but it's good to know they are available. This NVR also offers remote access through its built-in web server that you can log on to using a web browser, mobile device, or the included Free Central Monitoring Software. After little configuration you can receive up-to-date alerts based off of video based motion detection, optional alarm triggers, or video loss. We also include FREE iPhone iPad and Android Apps so your security camera system is accessible from anywhere in the world. How do you guys recommend the network setup of the internal poe switch on the NVR4324KPOE when attaching more than 16 cameras to the system? Also how do you recommend the ip address of it so that all the ip cameras are independently view-able on the network and not on a different ip range or subnet mask? On an NVR with built-in PoE the first 16 cameras will connect to the NVR's internal PoE using a subnet of 10.1.1.X. These cameras are not accessible on the network as they are on an internal network inside the NVR. All 32 channel PoE NVRs are limited to 16 PoE ports due to heat constraints. For the additional 16 cameras you would have to use an external PoE swtich, and configure the cameras to the same IP address as the network they PoE switch and NVR are connected to. For most networks this would be 192.168.1.X. The cameras on the external PoE switch would be viewable independently from a web browser as well. Regardless, of whether cameras are on the internal PoE or external, there streams can be fetched using our viewing software or by the NVR. Our business operates a small office building that currently uses an older security DVR system. We've thought about upgrading to a newer NVR (specifically SKU: NVR4324KPOE) and I had some questions. 1)This unit provides POE to 16 devices. If I start adding an addition 16 cameras, would I just simply get another POE device and then link it to the NVR? I'm not very acquainted with the more networked types of tech. 2)The item description of NVR4324KPOE says that it should be able to record 32 4K cameras all at once. Is that correct? I plan on grabbing the NVR and slowly over the course of a few months, switch out our cameras to newer ones and phase out the old stuff. You might get some follow up questions later...Thanks in advance! 1) Yes you would need to add a 16 port poe switch to add additional cameras beyond the first 16. 2) Yes it can record up to 32 channels at 4k as long as you are within the 200mbps incoming bandwidth limitation. The bit rate per camera depends on the frames per second and resolution you record at. If you plan to have all 4K cameras, then we recommend the NVR584K32POE as it has a higher bit rate maximum. Please note the unit is a NVR and not a hybrid DVR. You cannot use it with any old analog cameras using BNC. 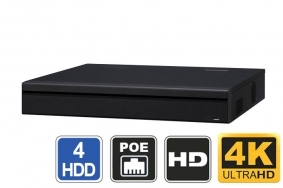 If you are looking for a hybrid, please browse through our Tribrid DVR category.